Just because your studio is less than 600 square feet, doesn't mean it has to feel like a tiny dorm room. Of course, you can't magically expand your apartment's footprint (unless you knock down your neighbor's walls). But with a little space planning and the right décor, you can maximize every square inch of your place to create the grown-up home you deserve — no remodeling required! Continue to 2 of 13 below. Make your apartment feel colossal by creating separate living areas. But how much square footage should you assign to each section? Consider what would make you happier at home. Want to invite friends over for Netflix? The person who lives in this NYC studio created a large living room worthy of a binge-watching party by sacrificing some bedroom and dining space. If you're not allowed to paint your walls, here's another idea to steal from this apartment — Removable, peel and stick wallpaper. It's easy to install, and it will dress up dull walls without jeopardizing the security deposit. Continue to 3 of 13 below. If you're always on the go and home is just a place where you shower and sleep, why not style your apartment like a boutique hotel room? But the star of this apartment, as you'll find in any stylish hotel room, is the comfortable bed decked out in high thread count sheets. Continue to 4 of 13 below. When it comes to small space decorating, nothing beats the magical room expanding powers of low profile, midcentury furniture. Compared to many contemporary styles, midcentury designs sit much closer to the floor, which makes ceilings and windows appear taller. Such is the case in this sunny 270 square foot studio in Montmartre, Paris. If you have high ceilings, you can magically whip up more livable square footage with a loft bed. 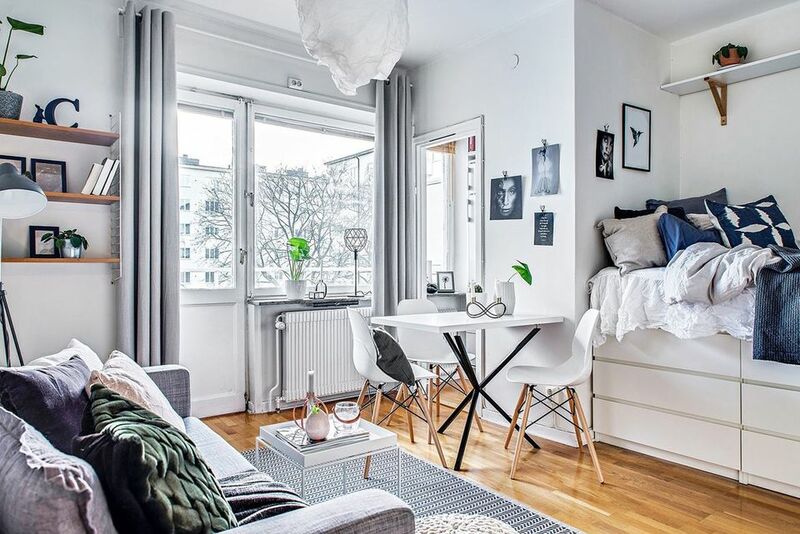 It's a winning idea that transformed this 193 square foot studio in Stockholm into a one bedroom duplex —see the cozy living room. But the second level isn't the only reason this Scandinavian charmer appears much larger than its actual size. The walls and décor are both gallery white. Together they blur where the ceiling starts creating an open and airy effect. Room warming accents in metal and leather keep the bright, white interior from feeling antiseptic. If you're obsessed with storage, another exciting feature is the staircase with built-in drawers. We just have to ask that if you steal this idea, please add handrails for safety. Continue to 6 of 13 below. This railroad apartment in Gothenburg, Sweden, is less than 190 square feet. Here's how smartly placed décor transformed the minuscule dwelling into a tiny comfortable abode. The first order of business was creating a multifunctional area for both sleeping and socializing. A beautifully styled bed that doubles as a sofa carved out the perfect spot. A leggy desk and also two small tables that don't detract from the room's openness add function. Our favorite, finishing touch in this little nest is the cozy Moroccan rug. Continue to 7 of 13 below. When it comes to optimizing itty-bitty studios, Graham Hill is a wizard at making them feel twice their size. His company, LifeEdited, works with architects and developers in the creation of ultra livable micro-apartments. Hill's current project is a 350 square foot studio that he shares with his partner and their two dogs. Keeping the layout fluid is key to making their home multifunctional. Double duty furniture makes it possible. Versatile pieces like a modular sofa and expanding coffee table can quickly transform Hill's living room into a dining room. See the storage wall across from the TV? It conceals a Murphy bed. Continue to 8 of 13 below. This little nest makes the most of every nook and cranny to create three separate living areas. A small recess in the corner creates the perfect spot for a bed and extra storage. In front of the kitchen's entrance, a patch of wall space becomes a cozy breakfast nook. Across from the dining table is a love seat that establishes the living room. A rug in front enhances the sense of separation between all three areas. Placing furniture near the foot of your bed is another great way to create a little separation between the living and sleeping areas. You can use a sofa or desk, or both as shown in this bright and colorful micro-loft in downtown Los Angeles. Does your studio have a hallway entryway? Keep your main living area clutter free by keeping storage and display furniture in the entryway. Continue to 10 of 13 below. If you own your studio apartment, consider investing in clever built-ins and flexible furniture. Features like these will not only make your space feel huge but may also add value to your home when it's time to sell. Here are some design goals to inspire. This studio in NYC's first micro-apartment building designed by nArchitects features transforming furniture and integrated storage that maximizes square footage. The built-in cabinet wall behind the sofa conceals a Murphy bed. The unit below the TV provides extra room to keep stuff out of sight. Innovative solutions like the double duty coffee table and expanding kitchen console create more space for dining or working. Continue to 11 of 13 below. Dividing up space for different uses in a box-shaped studio with low ceilings only seems challenging. The trick is using the right furniture. This San Francisco micro-loft is decorated with a mix of low-profile and leggy finds. The furnishings don't take up a lot of vertical space, so the ceiling appears higher. This easy to copy layout places a full-sized bed near a low profile sofa to create additional seating. A room divider at the head of the bed is the tallest object in the apartment. It carves out a dining nook decorated with industrial-inspired furniture. Continue to 12 of 13 below. Sick of looking at the kitchen while in bed? You can make your bedroom feel more private with a partition. There are a variety of things that will get the job done, from folding screens to built-in sliding doors. But we prefer the simplicity of this room divider curtain spotted in an apartment at White Stone Studios in Phoenix. This 450 square foot dwelling also has a 200 square foot yard. Turning your cookie cutter studio into a chic one-bedroom apartment is entirely possible with a few key pieces. Three standout items transformed this former crash pad into a jewel box home. First, is the IKEA KALLAX bookcase (it costs only $200!) that carved out the bedroom. If you're looking for a solution that won't block sunlight, this unit is the perfect small space partition. It also provides practical storage, which nearly every studio apartment needs. Next, a lovely, large ikat rug anchors the living room. Since the walls are bare, the colorful floor covering makes a big stylish statement. What's the piece de resistance? The Lucite storage chest. Since the item is crystal clear, it doesn't appear to take up floor space. When You Live in One Room You Don't Need to Sacrifice Style! How do I Decorate My Empty Corners?